This help topic shows you how to use eHive’s search page and search box. Please also see the next topic Constructing searches in eHive for instructions on how to structure your searches to achieve the best results. You can perform 4 different types of searches from eHive’s search page. You can select which type of search you would like to perform by selecting the appropriate tab above the search box. All of eHive: This type of search looks across all of eHive for the term that you have entered. Your results may include object records, as well as profile pages for Collections and Communities. Objects: Use this search to limit your results to object records that have been published on eHive. Collections: Use this search to limit your results to the profile pages of collecting institutions and private collectors. Communities: Use this search to limit your results to the profile pages of eHive Communities. My Objects: Use this search to limit your results to your own Public and Private object records. 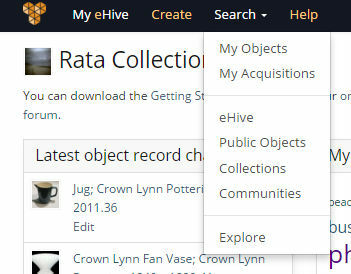 Note: As a signed in user, the search box in eHive’s Menu bar will also perform a My Objects search. My Acquisitions: Use this search to limit your results to your own Acquisition records. For more information on viewing your own saved records, please see the Help topic Viewing saved object records. If you would like to limit your search results to records that have images attached, tick the ‘Objects with images’ checkbox when searching from the Objects or My Objects search page.